A California lawyer–turned-restaurateur adds sleuthing to her resume. Sally Solari never cared much for her job as an attorney. So when her mother died, she went back to helping her father run Solari’s, an old-style Italian restaurant on the water in Santa Cruz. Her life suddenly changes with a call from a former boyfriend, Assistant District Attorney Eric Byrne, who informs her that her aunt Letta Solari has been found dead in Gauguin, her Polynesian-themed restaurant. Letta’s sous-chef, Javier, is the prime suspect, since she was stabbed with his knife, taken from a cabinet to which only the two of them had keys. Sally is shocked to find out that Letta left her the restaurant. She asks Javier to keep Gauguin running while she looks for an alternate suspect. Letta had a boyfriend, Tony, but Sally’s surprised to discover that her past also included a girlfriend with whom she recently reunited. In addition, Letta received a number of threatening letters from an animal activist decrying her use of factory-farmed meat and fish. Some insider information Sally gets from Eric gives her still more ideas about possible motives. Eager to come to terms with her loss and set her future course, she keeps digging when Javier is arrested, despite warnings to back off. 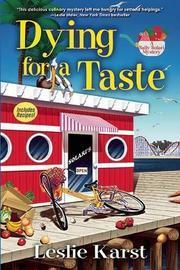 Karst’s series debut features a spunky heroine, a mystery loaded with red herrings, oodles of food lore, and the requisite appended recipes.